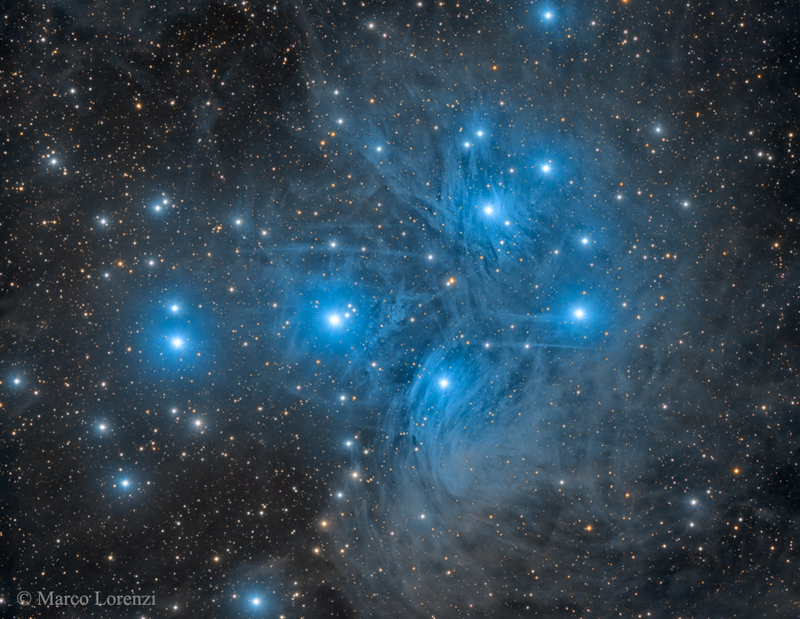 The Pleiades is a beautiful open star cluster in the constellation of Taurus. It is one of my favourite targets during star parties because it gives different views and perspectives at different magnifications from naked-eye views to spectacular telescopic images. 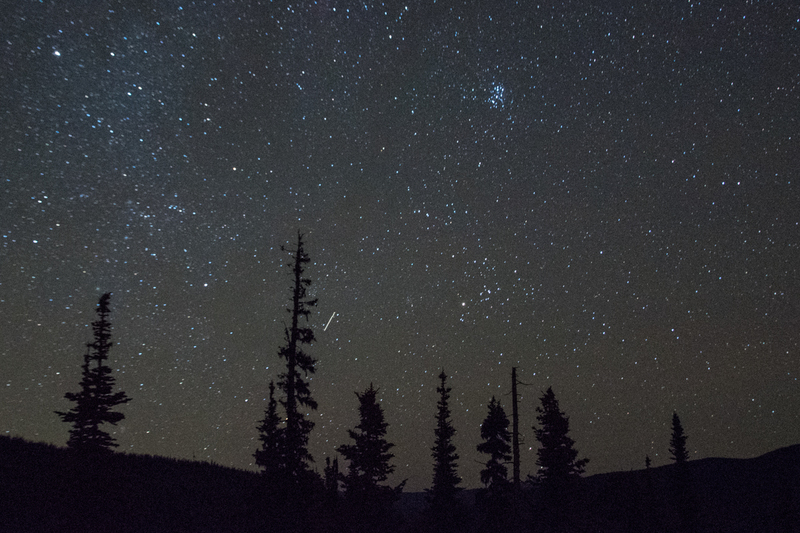 Recently, at the Manning Park Dark Sky Weekend and a Starry Nights event, we had people progress from a naked-eye view to using 8x binoculars while they waited for their turn to look though the telescope. The cluster is also known as the Seven Sisters or Messier 45. 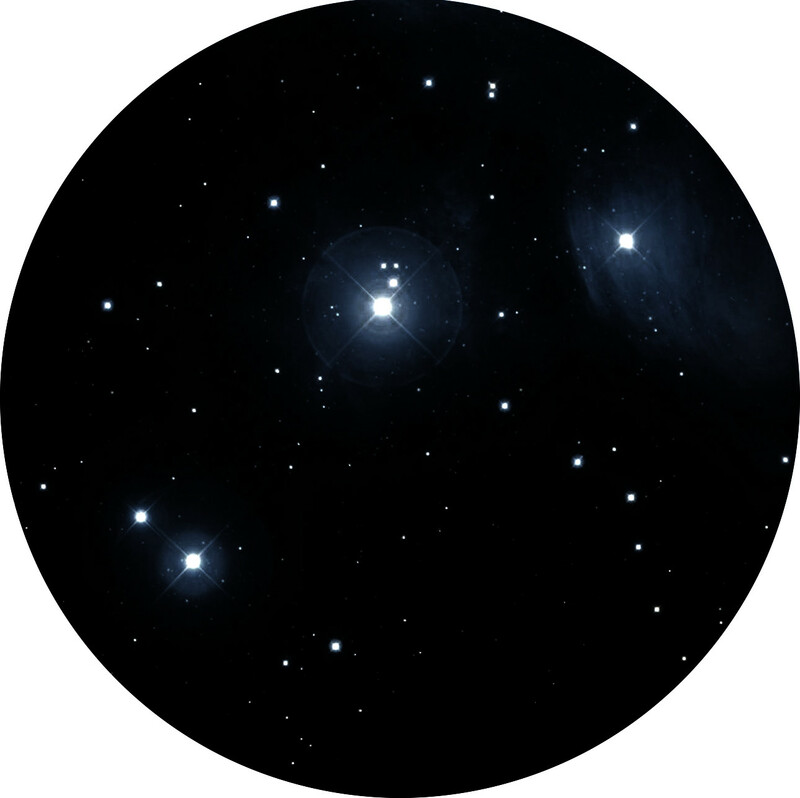 It is obvious to the unaided eye: I see it as hazy bright patch from light-polluted city skies but individual stars can be resolved from a dark site; typically 5 to 6 member stars are visible to people with good eyesight. 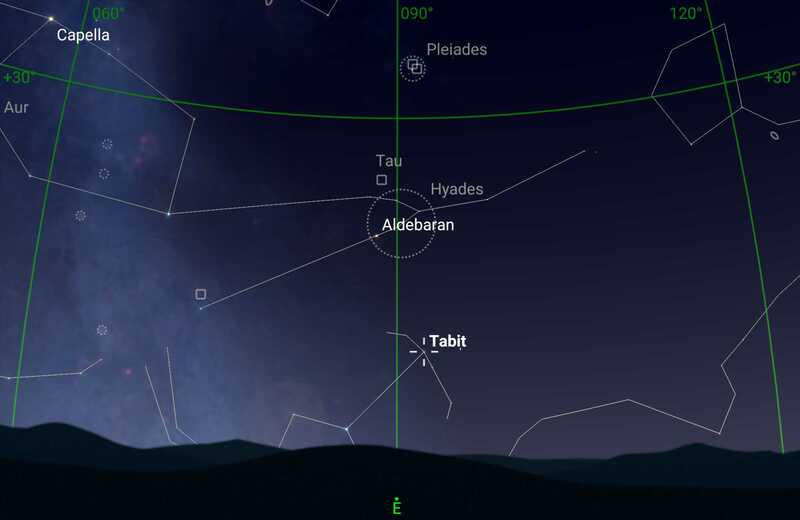 The cluster is located about 10° north-west of the bright orange star Aldebaran which can currently be found by looking due East around 08:30pm PST. The seven brightest stars are named for the Seven Sisters of Greek Mythology: Sterope, Merope, Electra, Maia, Taygeta, Celaeno, and Alcyone. These stars plus two more, named after their father Altas and mother Pleione are clearly visible in binoculars. A telescope and eyepiece that gives a wide field of about 2.2° provides a glorious close up view of the main stars of the cluster plus additional dimmer stars. Galileo was the first person to view the Pleiades through a telescope and thereby discovered that the cluster contained stars not visible with the naked eye. I like to think that he said “Wow” like many our star party attendees. Messier’s inclusion of the Pleiades as M45 in his catalog of comet-like objects is curious: it is much brighter than most of other objects in the catalog and cannot be easily mistaken for a comet. The cluster’s core diameter is about 16 light years and it includes over 1,000 confirmed members excluding unresolved binary stars. Its light is dominated by young, hot blue stars. Swirls of nebulosity are noticeable around the brightest stars from dark skies when the moon is absent. 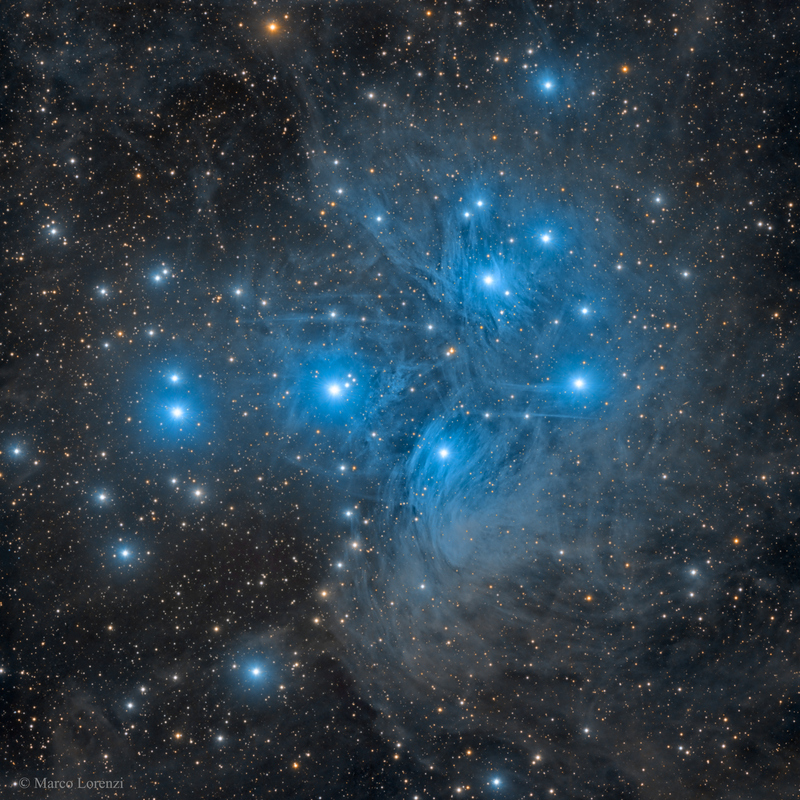 The Pleiades’ nebulae are blue-coloured which indicates that they are reflection nebula – clouds of dust and gas that reflect the blue light of nearby stars. Narrower Telescopic View: click for a larger view. This nebulosity can be glimpsed in higher-magnification telescopic views, though it often appears as faint bluish-gray patches through the eyepiece because our eyes are not sensitive to colour at low light levels. It was initially thought that the dust may have been left over from the formation of the stars in the cluster but later observations showed the cluster just happens to be moving through a dusty portion of our galaxy. How was this determined? The radial velocity of the stars was measured and found to be different from the velocity of the dust by about 11 km/sec. The nebulosity becomes stunning in long exposure images like this one that took almost 12 hours. I enjoy the views of this glorious cluster despite not knowing their proper pronunciation (PLAY-uh-deez, PLE-uh-deez, play-A-deez).